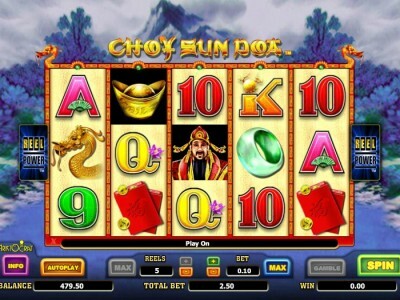 Choy Sun Doa is an oriental inspired pokies from Aristocrat gaming featuring Chinese style graphics and well known sound effects. With similar game play to 5 Dragons, this is an exciting and innovative Australian pokies that you will find in most Australian casinos with 243 ways to win. Symbols including Choy Sun Doa (WILD), Gold Ingot (SCATTER), Carp, Gold Coin, Dragon and Chinese symbols. 3 or more of the scattered Ingots left to right trigger the free games feature, select between the following..
During free spins the Chinese book appearing on reels 1 and 5 result in a bonus prize of 50, 20, 15, 10, 5 or 2 multiplier. Choy Sun Doa is a very popular game with Asian players at Crown Casino and players will be delighted that aristocrat pokies are now available for free play. Have a play on our demo game by clicking the link above.